Cheap Formula Deals: CVS and Walgreens! You are here: Home / drug store deals / Cheap Formula Deals: CVS and Walgreens! If you’ve got a little one on formula, I know that the expense QUICKLY adds up! Here are a few formula deals this week that will hopefully help ease the strain on your wallet. CVS ~ it’s like you’re saving $16 after coupons and ECBs! 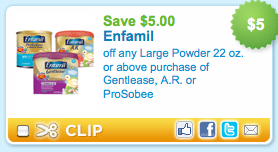 NOTE: If you have Enfamil formula checks, you can also use them with this deal! Final Price = $7.99 after coupons! If you can’t find this coupon with your default zip code, check out zip code 64119. Hurry and print yours before it’s gone! Walgreens: Enfamil formula for $10.50/each! 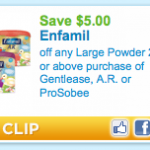 Walgreens Print & Save: Enfamil & Enfagrow powder for as low as $9 each!